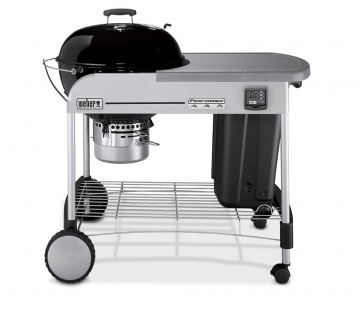 The Weber Performer Gold Charcoal Grill. This was the top rated grill in Cooks Illustrated, and I was in need of an upgrade — I mainly wanted more available area for cooking. I could have gotten the simpler 3 legged version of the Weber, but I liked the idea that this one has a built in table surface too. As I cooked with it I began to realize that it was thoughtfully designed for a charcoal grilling workflow. For instance, when I lit the coals, I had to put the grate somewhere, and there’s a sturdy hanger for that. This grill feels “designed” and it is designed well. The gimmick: A cheap digital timer. This thing was easy to build, and the parts fit together well. It took me about an hour. Once built, it is very solid, not wobbly at all. How easy is it to get charcoal out of the bins? Does a scoop work or need a little pitchfork? I just turn the bin over and whack it against a tree.